Per visitare questo sito web bisogna autorizzare l&apos; impiego di cookie. Invitiamo a cliccare su "Informativa sui Cookie" per maggiori informazioni sull&apos; argomento. Chiudendo questo banner, scorrendo questa pagina, cliccando su un link o proseguendo la navigazione in altra maniera, acconsenti all&apos; uso dei cookie. 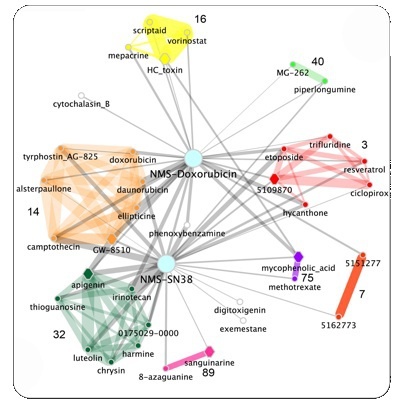 Mode of Action by NeTwoRk Analysis (MANTRA) is a computational tool for the analysis of the Mode of Action (MoA) of novel drugs and the identification of known and approved candidates for “drug repositioning”. It is based on network theory and non-parametric statistics on gene expression data. In order to study a novel drug users have to give to MANTRA one or more genome-wide ranked list of genes sorted according to their differential expression in a treatment with the drug. On the basis of this input, MANTRA automatically integrates this novel drug in a huge network of compounds in which the topology reveals similarities and differences in MoA. To make novel hypothesis on known and FDA approved drugs, hence to find “repositionable drugs”, users have just to explore this drug network. Our MANTRA transforms the information hidden in a microarray experiment into a meaningful landscape of drugs providing an “enlightened” view of them. A Tutorial or an example of Mantra Workflow can be displayed in order to understand the functioning of the different workspaces. The MANTRA analysis framework is implemented as a set of MATLAB functions. The online version of MANTRA has been integrated in a customized version of the MEDUSA visualization system (a front-end to the STRING protein interaction database). MANTRA is maintained by di Bernardo Lab members at TeleThon Institute of Genetics and Medicine (TIGEM). MANTRA has been developed by Francesco Iorio. The method has been conceived by Francesco Iorio and Diego di Bernardo. capable of creating “spiritual transformation”. User data are stored permanently in our database and made freely available to everyone in the form of new "nodes" in the drug network (note, however, that the raw transcriptional profiles are never made publicly available).